These Things Aren't Talked About Every Day Bowhunting mature whitetails is my greatest passion. It’s what I love to do. It’s who I am. And so I spend a lot of time studying them. There are a lot of things about whitetails that we still don’t know. Much of it we may never figure out. But that’s the challenge. That’s what makes hunting these elusive critters so much fun. In the world of outdoor media, a lot of theories and ideas float around. Some of them are true. Some of them aren’t. Simple as that. Hunters abide by a lot of traditions—some of which they live and die by—that define the hunter they are. Those same traditions and principles define their success, one way or the other, too. I’ll be up front: I’m going to ruffle some feathers with some of what I have to say here, especially on wind. But that’s okay. I only write about what I’ve come to know through my real-life experiences as a deer hunter. And I’ll stand behind those same theories and concepts until I’m proven wrong. I’ll use the 4-year-old Kentucky buck I shot in full velvet last season to illustrate each of these five things. We’ll call it a case study, so to speak. Trail watching, or stand hunting, is a science and an art and to illustrate that stand hunting is the most popular and productive method of deer hunting. After years of personal reflection and discussion with other hunters, I have come to recognize distinct phases in the personal evolution of a trail watcher. I will describe them in this article, illustrating each phase with a case history of a hunter in that phase. There are five phases, and hunters may progress through them in an orderly fashion or skip a phase completely. Severe weather or discouragement may cause a regression, but most hunters will stay in one phase consistently. They will move up to higher phases as their age and hunting experience increase, and as they are exposed to good role models. A sixteen-year-old boy is deer hunting for the first time. He is told by his father and brother to stand near an oak at the edge of a small pine plantation. His hunting partners walk away and circle the grove, preparing to make a brief deer drive. Shortly after they leave, the boy begins to feel cold. His hands become stiff He takes off his mittens and puffs warm air between his fingers. He moves a few steps to one side so he can lean against the tree. He stamps his feet to warm them. In a few minutes his partners emerge. The boy eagerly volunteers to make the next drive. Standing is cold and boring; he thinks to himself He wants to move those deer. Let me say at the outset that I am not being judgmental about these phases. The driver phase is not bad. The boy is an eager hunter, despite his impatience, and he is a valuable member of his hunting party. He represents the future of hunting and his desire to see and move deer is wonderful. But he is not a trail watcher. He will see a lot of tails and he may get a shot, but he won’t be as successful as he will later on when he matures as a deer hunter. He also won’t be a bow hunter until he is able to stay on stand. Basically, the phase one trail watcher doesn’t figure it’s worth it. He doesn’t want to be on stand. He fidgets and fusses, twists and moves. He has no mental barrier against cold or other discomforts. He only stays on stand because of peer pressure—someone tells him to stay put until they return. The phase one trail watcher has only external control; left to his own devices, he will move from spot to spot, driving deer. The phase one deer hunter has little confidence in the deer trail he watches, partly due to inexperience and partly due to inadequate preseason scouting. 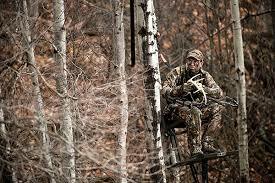 He will leave a stand if not immediately successful, for example, after the first hour of the deer gun season. I know phase one hunters who take a stand and proceed to fidget, even smoke, saying in effect, “I don’t like being on stand, and I don’t care if I see deer or not because I’m planning to leave soon anyway!” If you are a phase one Driver and want to change, take heart. A twenty-one-year-old man watches a small, brushy ravine on the second day of deer gun season. Last year he shot a deer here while standing on a drive and his scouting confirmed a good deer trail at the bottom of the ravine. While it was difficult for him to wait on stand during opening day, he forced himself to remain quietly concealed. He had been rewarded by seeing several groups of does, but he saw no antlers. This morning he arrived on stand a bit late and a large deer (actually a ten-point buck) bounded into the ravine before he could get a good look at it. The morning air is very cold, and his toes are numb. He endures several hours, but in the afternoon he takes a different stand. The big buck picks his way through the ravine that evening, sniffing for danger. He walks past the hunters empty stand, stops for a minute, then continues on. Our phase two hunter has the right idea. If he had been a little more persistent, either arriving earlier or staying later, he would have had a chance to collect a nice buck. But the stander is not yet sold on the benefits of such persistence. He is tolerant of stand hunting because he has discovered that it works. This type of hunter will stay put for a while, then will move out, especially if the weather is bad or other hunters aren’t moving deer. He doesn’t believe in his stand. Phase two trail watchers are opportunists. If there were some other method which worked better, they’d switch in a minute. They enjoy moving and driving more than watching. The behavior pattern typical of phase two hunters is stand jumping. They spend two hours on one stand, three hours on the next and one hour on the next, with no good reason for the switching except the change of scenery. A phase two hunter welcomes disruption. He climbs down from a tree stand happily, stretches and is on his way. A thirty-year-old woman who is an experienced hunter moues slowly down the fire lane, bow in hand. At a crucial turn in the path, she stands for ten minutes as if frozen, listening to a rustling of leaves. When she finds the noise is squirrels instead of deer, she walks slowly on, arriving at her stand in the late afternoon. Again she remains silent and still, waiting patiently. An hour passes. A fork horn buck approaches quietly and The Stalker draws her bow. She holds her sight on the area where the deer will be in the open. The fat little buck walks into the opening and The Stalker releases. The arrow strikes home. She is elated and relieved, no more hunting this year. Some of you may be thinking, “This type of hunter is good enough for me.” The Stalker is a good hunter; there is no doubt about that. But she or he could do better. The Driver is impatient; The Stander is a driver who is more tolerant of standing, and The Stalker is a stander who moves slowly and switches stands less and thus can sometimes catch a deer unaware. The Stalker uses the right techniques, but his or her heart is not on stand. A phase three hunter enjoys movement too much. The Stalker will take a stand, but enjoys walking more, although at a much more sedate and productive pace than phase one or two deer hunters. Again, I am not being critical of The Stalker. Stalkers are not able, however, to stay on stand when the going gets tough. They will find an excuse to move, and even if that excuse is a legitimate one like lunch, the phase four and five hunters would not succumb to it. They bring their lunch. Phase four and five deer hunters stay on stand regardless. You’ll see what I mean. They are the iron men and women. They may not bring home more deer than the stalker, but they are more likely to bring home the big ones. They are the true trail watchers. A forty-year-old man in the prime of his hunting years sits on stand. A bitter cold, northwest wind blows and it is the last weekend of the deer gun season. He is alone in the woods—there are no other hunters to moue the deer. He has waited on the same stand day after day, knowing that a large buck has been using the area consistently. Twice he saw the animal, but both times it was out of range and visible for only a moment He is waiting for this one deer, this particular deer, so he clings tenaciously to the tree, enduring the gusts which chill him to the bone. He thinks of other things, disciplines his mind to concentrate on the dim deer trail and sits stubbornly. He is patient beyond belief He will sit in the same stand tomorrow, the final day of the season, if the buck doesn’t come today. Snow settles into his collar and his beard is frozen solid. The phase four trail watcher is a stoic sitter. This hunter has determined that sitting is the best way to hunt, provided he’s on the right trail, so he clings to his perch day after day. He may be wrong sometimes and may switch stands every several days or so, but he is likely to be consistently on stand. He hunts all day even during the bow season, especially during the rut. He learns the personalities of various deer and he hunts for trophy bucks. It is not easy to be a phase four Sitter. Besides a high pain threshold and incredible patience, a phase four deer hunter is a perfectionist. He will pass up shots even a phase three hunter would take. He wants not just an open shot, but a picture-perfect shot. He wants an eight-point buck not a six-pointer. He is of the right stuff. But he is too much in love with the hunt, too concerned with the quarry to relax and really enjoy. It is all pain and only occasional gain for The Sitter. Like The Stalker, he can only be content once he has a deer, but unlike The Stalker he has mixed feelings about getting a deer. Then the hunt is over and the phase four trail watcher doesn’t want the hunt to end. He is on his way to phase five. A fifty-five-year-old man who suffered his first heart attack two years ago is on stand. A very experienced hunter, he’s killed many deer from stand with bow and gun. Since his heart attack, however, he is less intent on killing deer and more intent on seeing them.. It is the second month of the deer bow season and the autumn sun is warm. He relaxes on stand and drinks in the scenery around him. The woods are auburn. Geese fly overhead and he eyes the flock, wondering where they’ll be tonight. He has been on stand many hours, since dawn, and he watched the sunrise and listened to the woods wake up. He has learned that each deer season is a gift which he can’t take for granted. He hears a sound in the leaves. His eyes move slowly, finding the doe and fawn. He doesn’t draw his bow. They are not his quarry today; he has come to watch more than to kill and he will stop watching only if a very large buck interrupts. The Watcher is a Sitter who has moved into phase five by enjoying instead of enduring the outdoors. When it is cold, he listens to the trees crack and imagines what it must be like for the chickadees which flit from branch to branch. He still enjoys the hunting, but he’s not just waiting for a deer, he’s waiting for anything. Any change in weather, any animal or bird, any contour of the landscape will enthrall and reward him. His discipline is not only of the mind but of the spirit: he considers himself part of the plan for this piece of creation, fits himself in and takes it all in. Part of his ability to watch rests in his recognition of his own mortality and the preciousness of his time outdoors. He needn’t be old, but he must have passed through at least several of the phases of driving, standing, stalking, and sitting. Watching is a learned art, a practiced science. Odds are you are well on your way to being a Watcher if you are reading this. It is a personal evolution this process: these are the phases of trail watching we must pass through. One day you will be sitting on stand, a cold drip at the end of your nose, and realize you have been there for six hours and have enjoyed every minute. You will be a whitetail deer hunter. Remote areas frequently contain low densities of hunters. Deer populations, though smaller, usually have a better buck-to-doe ratio and more mature bucks than heavily-hunted areas. I felt a sense of relief and a surge of excitement as my flashlight beam finally settled on the spot from which I hoped to shoot a whitetail buck. It was opening day of the firearms deer season. The hike had been a long one in the dark. My stand was more than a mile from where I parked the car. The effort would be worth it, however, because there would be few, if any, other deer hunters back this far. But there were deer. After setting my rifle and back pack aside, I sat on a boat cushion put there several days before, and leaned back against the roots of a downed tree. A half-hour remained before it would be light enough to see. I was on schedule. Then I thought about the other deer hunters who would be in the area that day, but closer to the roads. Some were probably just getting out of bed. Others were eating breakfast, and still more, no doubt, were driving to where they would park their cars. Most of them wouldn’t enter the woods until it became light enough to see. During the course of the day, I probably wouldn’t see any of them, but perhaps one or more of them would unknowingly help me get a deer. I wouldn’t have to rely solely on someone else chasing a buck to me, however. My stand had been carefully chosen. It overlooked a runway marked by several scrapes, a rutting buck’s calling cards. That doubled my chances of scoring. Those are the advantages of getting away from the crowds when hunting for woodland whitetails. The deer try to do the same thing and often run into me or a member of my party in the process. Or, it is possible to intercept a buck on a daily routine, undisturbed by the influx of redcoats close to roads. Our rate of success speaks for itself. In recent years, all of us filled our tags. I can’t recall a year when only one of our party scored. We prefer to hunt whitetails away from most other deer hunters for several reasons. First and foremost, we like a little privacy. Being where other hunters are frequently in sight or passing by distracts from the quality of the experience. If we wanted to see people, we’d stay home or go to town rather than go deer hunting. We also feel a greater sense of security by being away from crowded areas. Unfortunately, not all deer hunters are sportsmen, and some lack proper respect for handling firearms. The further we go from roads, the less chance of encountering these individuals. Additionally, few whitetails hang around for long in localities where hunter densities are high. At least not the older, wiser animals who survived a previous season or two. 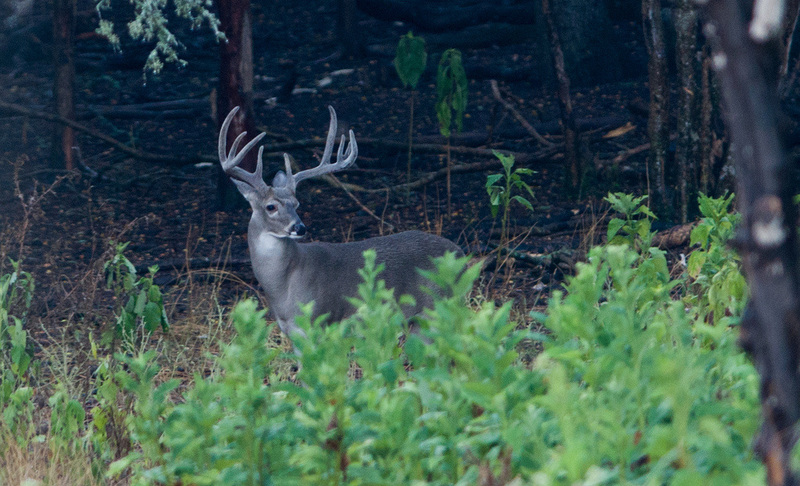 In locations where hunting pressure is consistently low, bucks also have a better chance of growing respectable racks. Like most individuals who hunt whitetails, we are satisfied to get a chance at any legal buck, but we try to improve our odds of seeing and bagging bucks with big racks. We hunt deer in the Upper Peninsula of Michigan, but our techniques can be successfully used just about any place where tracts of unbroken woodlands exist. Here is how we operate. We usually begin preparations one or two months in advance of the deer season. However, there are advantages to beginning even sooner. Early spring (as soon as the snow melts) is a perfect time to get a jump on fall scouting because deer sign made the previous fall is usually still clearly visible. Every year we check out at least one unfamiliar area that looks promising. We search for a tract of public land, without any drive able roads penetrating it, at least one square mile in size. Hunters with access to private land with restricted hunter access can concentrate on smaller chunks of real estate. We also keep up with annual harvest reports and concentrate our efforts in counties with the highest deer populations. This information can be obtained from the Department of Natural Resources of Fish and Game Office in your state. In recent years, I’ve been shifting emphasis from woodlands with high deer densities towards counties that produce big-bodied, big-racked bucks. Deer numbers are often low in these locations, but so are hunter numbers. For this reason, areas with low deer densities often offer the best opportunity to get away from other hunters while upping the odds of getting a crack at a trophy buck. Hunting such an area isn’t without its drawbacks, however. Hunters must be content with seeing fewer whitetails in such a setting. Possibly going some days without sighting any deer. When a deer is seen though, it’s more likely to be a buck because the buck-to-doe ratio usually approaches one-to-one where deer populations are low. Whichever circumstance hunters choose, the process of site selection, scouting and eventual choice of stand location remains the same. To locate parcels of land for investigation, we consult county maps that show road less tracts of land and then scan plat books to determine the ownership of certain acreages. Keep in mind that most county maps won’t show logging roads constructed in recent years. Once we pinpoint an area, we plan a trip to scout the terrain. A variety of small game seasons are open in Michigan from mid-September through mid-November. The firearms deer hunt begins November 15. We usually combine small game hunting with scouting. The same thing is possible, of course, to prepare for bow hunting. In fact, time spent in the field with bow and arrows helps prepare the two-season hunter for the firearms hunt. Since we generally don’t have marked trails to follow, we use a compass to find our way around. On the initial visit, we get a feeling for the lay of the land, determine the type of cover present and try to pinpoint spots toward the interior where deer might head to once the shooting starts on opening day. These same spots often serve as favored haunts for the biggest bucks in the area. And not surprisingly, these spots usually are the thickest and roughest in the area. Past experience has taught us that what looks forbidding to a hunter is home-sweet-home to a buck interested in keeping his antlers intact. Separating an area into cover types often makes the scouting deer process easier. Deer activity is often concentrated in certain spots, not uniform throughout. We look for these centers of activity and find that whitetails frequently travel along the edges that separate two different cover types. On the first visit we try to figure what the hunting pressure will be like. Before going in on foot, we drive around the perimeter, where possible (sometimes roads don’t traverse all sides), to see if there are any unmapped roads penetrating the area. If we find one, and it goes in very far, we go elsewhere. Easy access usually means there will be plenty of company. While scouting a potential hunting area on foot, we look for signs of hunter activity such as blinds, trimmed shooting lanes and discarded cans or bottles, in addition to deer sign. If evidence of hunter pressure is concentrated near access points, we’re all set. We always avoid locations where other blinds have been constructed. Ideally, we like to find features along the borders of an area we hope to hunt that discourage other deer hunters from entering. Rugged terrain or a thick marsh or swamp usually has that effect, and so does private property. These features decrease the likelihood of heavy hunting pressure to some extent. We don’t mind the extra effort required to reach a spot, because it increases the odds that we and the deer will have it to ourselves. We located such a spot a number of years ago. 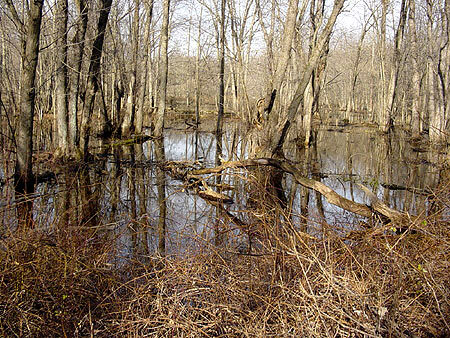 A half-mile-wide marsh surrounded a tract of upland terrain containing evergreen swamps and stands of beech trees mixed with other hardwoods. The marsh was so wet we had to wear chest waders to cross it. After reaching dry ground, we stashed the waders until the end of the day and the return trip. We didn’t see another soul on that parcel of land the entire season! For our efforts we got a spike-horn and six-point bucks. I’m sure bigger, older bucks lived in the vicinity, based on the sign, but they eluded us. As we check out the terrain in a promising tract of land, we keep our eyes peeled for well-traveled run ways, possible feeding or bedding grounds or anything that might tell us something about the deer patterns in that locality. What we see is committed to memory, but we don’t get serious about this and the movements of the deer until a later date. From experience, we’ve found that whitetails can change their habits in the span of a month, and some most certainly do after opening day of the firearms season. We usually have several areas in mind by early November, then start the process of elimination to single out what we feel will be the best location. We tour each area, looking for buck scrapes and rubs, and we concentrate our search around the more remote reaches of dense cover or rough terrain located earlier. We can usually tell what runways the deer are using and, in certain cases, how big a rack a buck is carrying. The diameter of trees which a buck rubs with his antlers can indicate the size of his rack, especially if it is wide. When bucks polish their racks, they usually get the tree or sapling between both beams. Brow tines out the middle of the trunk and main beams rake against the sides. Normally, rubbed trees are saplings no more than a few inches across. However, big-racked bucks often use full-fledged trees. If you locate scarred trees up to a foot across, you can bet the animal that did the job is worth trying for. One fall I located buck scrapes and a series of abnormally large trees that had been rubbed. I knew the buck that made them had to be a dandy, so I chose a stand in that locality. The second evening of the season he showed himself and I got him. To date, that is one of the best white-tailed bucks I’ve collected, and certainly the best as far as antler width. The rack carried eight points and the inside spread of the beams measured about twenty inches. The final choice of stands depends upon where I find the most encouraging buck signs. While we look at both scrapes and rubs, I always locate near scrapes. That way I know we are in the ballpark of at least one buck. I might add at this point that while I concentrate on hunting away from roads, if I find a promising spot close to a woods road where there is no evidence of other hunter interest, I will hunt there. There is little likelihood the animals we home in on will be disturbed enough to change their movement patterns once the season opens, since they live far away from roads and most other hunters. In addition, the remote setting attracts other bucks pushed out of their normal haunts by the opening day influx of hunters in easy-to-reach locations. Since we normally hunt in or on the edge of heavy cover, a spot to sit often lies within thirty to fifty yards of where we expect a buck to show. I simply look for a large tree trunk or stump (downwind) that will break our outline and serve as a backrest, perhaps with some natural cover around. On the other hand, you could build a blind, and there are advantages to having a blind constructed far enough ahead of the season that deer get used to. 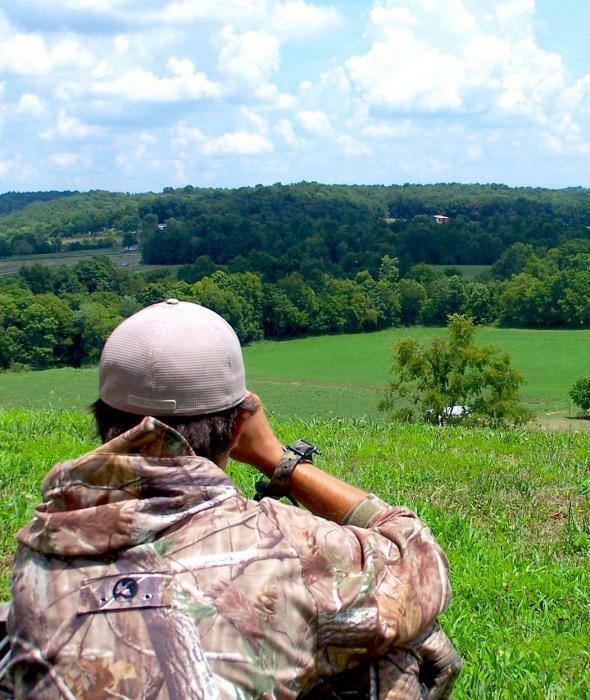 Hunters in blinds can often move more freely without the risk of being seen by deer. We also remove dead leaves from the ground around our stands to avoid the possibility of making noise as we stand up or shift our feet. Any dead limbs and branches that obstruct our view or might be in the way also are eliminated. A number of years ago, I learned the hard way about the benefit of clearing away twigs on all sides. I was sitting with his back against a stump late in the morning when I heard what I thought was another hunter walking behind me. When I peeked around the stump, there stood a beautiful ten-point buck. I slowly raised his rifle and swung around to face the deer, but as I shouldered the gun, the barrel hit a twig and snapped it off. The buck fled before I could get a shot. We can usually find our stands without the aid of a compass during the daylight hours, but finding our stands in the dark is another story. In the past, we wasted valuable time stumbling around in the dark when getting off course. We overcame that problem by marking trails to our stands using red or orange flagging over the last 100 to 300 yards, where going is usually the roughest. Blaze marks are sometimes cut on trees, too, and the white inner wood often shows up better in a flashlight beam. We carry many of the heavy clothes necessary for sitting comfortably during cold weather in backpacks. This reduces overheating on the hike to our stands. Heavy clothing is donned once we reach our destination. We carry lunches with us, too, so we can hunt all day. We like to be in position fifteen to thirty minutes before first light. This gives us a short time to relax before fully dressing and any commotion we create is usually forgotten by daylight, if any game was disturbed. If we position ourselves properly, we frequently get a chance at a buck the first few hours in the morning. The day I sat against the roots of that downed tree was no exception. First a doe and her youngster went by no more than thirty feet away. Ten minutes later a single whitetail approached from the direction they had gone. Just as it was about to enter a small opening twenty yards in front of me it stopped. That’s when I saw antlers! My grip tightened on the rifle. The barrel was already pointing to where I expected the buck to step out. He moved forward and I added pressure to the trigger. At the shot, the whitetail flinched, but instead of going down he came right toward me and passed no more than ten feet away! Without aiming, I leveled the rifle at his shoulder, extended it toward him. I saw hair puff up as my .30-06 slug entered. The buck never broke stride. I sat there in disbelief as he continued running. Finally, another twenty yards further, he collapsed. His rack carried six points. I suspect that part of the reason that buck stayed on his feet so long was adrenaline he had pumping from having been jumped by another hunter. Of course, not all the stands we select produce. Sometimes we see only does, or a buck gets away and doesn’t return. Two days is usually the maximum any of us sticks with a spot without scoring. One or more of us often bags a deer by then. Those with unfilled tags have the option to take over the successful stand, stay put or move to a new area. The same stand sometimes accounts for two bucks during the same season. After one or two of our party score, they spend most of their time moving around, either tracking deer, making informal drives or checking out unfamiliar patches of cover. This keeps some deer moving, increasing the chances that members of the party with unfiled tags will see action. Additionally, the roving hunters become more familiar with the territory and, on occasion, stumble onto a spot that might make a good stand for next year. That’s precisely how I located the spot where I shot the wide-racked eight-pointer mentioned earlier. My tag was already filled and there was snow on the ground, so I started following deer tracks in the hopes of moving some animals past my partners. The whitetails I followed led me to a patch of high ground surrounded by heavy swamp, and there was plenty of buck sign on that patch of ground. I blazed a trail through the swamp to the hot spot and hunted there the next year. The further away from a road we hunt, the further we have to transport deer. We used to drag them, and sometimes still do, if the distance involved is reasonable. However, for the longest hauls, we either cut the carcass into pieces for carrying on pack frames or drag carcasses to a nearby river and haul them out in a canoe. Whenever carrying deer on pack frames, the hide and antlers are covered with bright orange material to avoid being mistaken for a live deer. Getting away from the crowds to hunt whitetails can be a lot of work, but can be rewarding and fun, too. If you like to be where the deer are and other hunters aren’t, as we do, the technique is worth a try.